The 2019 Commencement will be held on Thursday, May 23, 2019 at 1:00 PM. The commencement speaker will be Montgomery County Board Commissioner Kenneth Lawrence. Commencement exercises are held annually at the end of the spring semester. Students who complete their degree requirements in the summer, or at the end of the fall semester, receive their diplomas following their completion of the degree requirements. The last day to order your Graduation Regalia online is Saturday, March 29, 2019. You can order online HERE. Orders placed after this date may incur additional fees. Anyone who needs to order a cap and gown package after the deadline must contact Ashley Hillegas, Student Engagement Coordinator (ahillegas@manor.edu). The Graduation Rehearsal will take place in the gymnasium on Wednesday, May 8, 2019 at 2:45 PM. This is when you will receive your cap & gown, tickets, and other information regarding your graduation. It is important for all graduation candidates to attend this Graduation Rehearsal. Please contact Dean of Students, Allison Mootz (amootz@manor.edu), if you experience a last minute illness/hardship and cannot attend on Wednesday, May 8, 2019. Each graduate will receive three (3) admission tickets to Commencement. Tickets are not required for viewing the Commencement Exercises in the Dining Hall on live stream. Children ages two (2) and under do not need a ticket as long as they will be sitting on the lap of an adult or in a stroller or carrier. Though extra tickets are not guaranteed, you may submit a request for extra tickets to Ashley Hillegas, Student Engagement Coordinator at ahillegas@manor.edu BEGINNING APRIL 15, 2019. If tickets become available, they will be distributed on a first-come, first-serve basis. Each year, The Office of Student Engagement holds a Graduation Picnic for the entire Manor community. It’s a fun filled day with lunch, music, giveaways, games and more! The Graduation Picnic will be held April 25 2019 at 12:00pm. For more questions, please contact the Student Engagement Coordinator. Graduation prayer services will be held the morning of the Graduation Picnic, April 25, 2019 at 10:00am. Ladies and Gentlemen are asked to wear appropriate dress/church clothes. This prayer service is a special way to offer Thanksgiving to God for your successful education. This is a solemn ritual, performed in the presence of your family, guests and Manor College Administrators. This prayer service is optional but we encourage you and your family/guests to attend. The Academic Convocation will take place on May 16, 2019 at 6:00PM in the Dining Hall. This will celebrate graduates who have achieved exceptional academic performance at Manor College. This event is invite only. This event celebrates the achievements of August 2018, December 2018, and May 2019 graduation candidates. The ceremony will take place on Thursday, May 23, 2019 at 1:00 pm. Degree candidates, wearing caps and gowns, will form the processional line no later than 12:45 pm. Seating for guests begins at 12:00 PM. Parking is on a first come, first serve basis. Please contact Bill Pepitone, Chief of Public Safety and Security at wpepitone@manor.edu if you have a medical condition that will require special needs assistance or seating. Students who intend to graduate and meet the residency requirement must see their academic advisor during registration the semester prior to their anticipated degree completion. Advisors and Students will work together to complete and submit a Graduation Petition. Once the Graduation Petition is completed and signed by advisor or program director, submit to Registrar for final approval. The Graduation Petition MUST be completed in order to be eligible for a degree evaluation. Only once all materials are received will an academic audit be done. Approval to graduate is granted by the Vice-President of Academic Affairs. Complete degree requirements. Contact your advisor or program director to verify completion of degree requirements. Satisfy all financial and library obligations. Degree candidates who have balances due at the Bursar’s Office or books due at the library must satisfy these obligations before they can receive diplomas. All financial obligations must be fulfilled prior to December 1 for December completers, April 1 for May completers, and June 1 for summer completers. Complete the loan exit interview. All students who borrowed a Federal Perkins or Federal Direct Student Loan while enrolled at Manor College must attend an exit counseling session to review their rights and responsibilities. Sessions will be offered in April at varying times and will last approximately 30 minutes. A specific schedule of dates and times will be sent to graduation candidates by e-mail. There will be a $5 sitting fee to take your pictures (credit, cash, or check accepted). The photographer will send you a link to view all pictures and you can pick and pay for your package at a later date. Email Ashley Hillegas, Student Engagement Coordinator at ahillegas@manor.edu to schedule your graduation picture. We will provide the cap and gown for photos. In the event of inclement weather, the decision regarding the location will be made the day of the ceremony and will be announced on the Manor College website by 7am the day of the ceremony. It is possible that the weather will be unseasonably warm. Students and guests are advised to dress appropriately if this is the case. Rain or shine, the commencement ceremony will be broadcast live through closed-circuit coverage in the cafeteria. Manor will webcast the entire commencement ceremony live on the Internet on this commencement website. Family and friends who cannot attend in person should log-on early to ensure a good connection. Commencement is a graduation ceremony at which diplomas are conferred. Work with your academic advisor and program director to ensure you have met all of the degree requirements. In addition, see the participation requirements section. What is “regalia” and is it required for graduation? Regalia refers to the formal attire worn during a graduation ceremony. This attire includes graduation gowns, caps, cords and stoles. To participate in commencement at Manor, you must wear the proper regalia. See the regalia section for complete information. I have guests with special needs (disabilities), how can I accommodate their needs at the ceremony? We have special needs seating area at commencement to accommodate those that have a medical need. Contact Dean of Students, Allison Mootz, to discuss you or your guests needs. I didn’t receive anything in the mail, so how can I obtain graduation information? All information regarding graduation may be found on this commencement website. 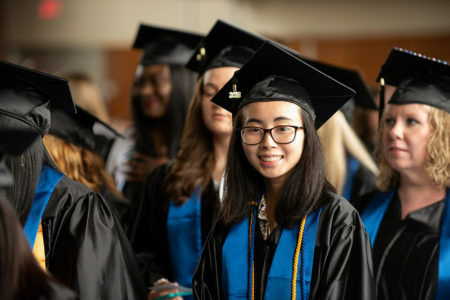 E-mail notices are sent to the entire Manor community advising everyone that https://manor.edu/student-life/graduation/ is the primary source for commencement information. The site is updated regularly, so check back often. Do you have a question regarding graduation that is not covered on this site? Please e-mail Dean Allison Mootz at amootz@manor.edu and we will get back to you soon with an answer. If you are planning on staying at a hotel near Manor College, Holiday Inn Express & Suites in Fort Washington offers a rate discount of 10% off. Hilton Garden Inn is offering a special rate to students, family and friends of Manor College students ($139 M-Th, $114 Fri-Sun). Rooms come with complimentary Wi-Fi, and the hotel has an indoor swimming pool and fitness center. Book with the special rate by following this link. *Restrictions apply. Please see the coupon below for full details.